At LWMOOCs II, we released CPSX, a bare-bones XBlock to include small-group chat sessions that accompany any instructional or assessment sequence in Open edX. In this talk I will describe the psychometric research that my colleague Peter Halpin (NYU) and I are doing with this tool. This work started out with direct-effect measurements of collaboration, using the framework of item response theory to compare performance together against a counterfactual prediction of performance alone. The problems used in both conditions (individual/collaborative) were drawn from the same pool of standard items. We are now piloting a new set of math items which promote more interdependence while still having right answers. The problems have both one-person and two-person variants, where the collaborative variants elicit a range of information sharing and strategy negotiation behaviors. 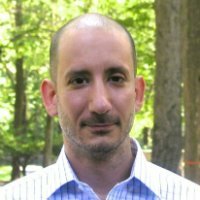 Yoav Bergner is a Research Scientist in the Computational Psychometrics Research Center at Educational Testing Service (ETS). After earning a Ph.D. in Theoretical Physics from M.I.T., Yoav spent five years as a sculptor and furniture maker and three more as a public school teacher. Teaching led to a refocused interest in education and post-doctoral work in physics education research. Bergner’s current research bridges methods from educational data mining, learning analytics, and psychometrics with applications to data from simulations, tutors, and online courses. He has developed CPSX, an extension for small-group discussion using the Open edX learning management system. Bergner is the PI of an NSF-funded collaboration to study social learning in online courses and a MacArthur-funded project to conceptualize assessment of learning in Makerspaces. He is a MacArthur/ETS Edmund W. Gordon Fellow for 21st Century Learning and Assessment.